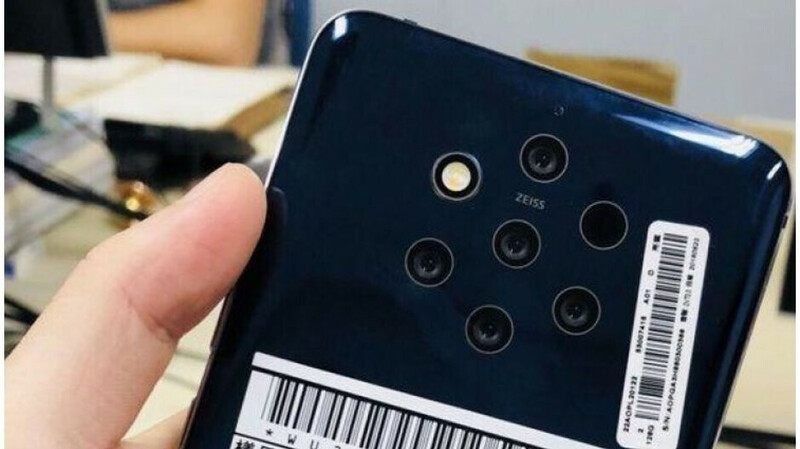 Last month, we showed you a hands on photo that claimed to show the back of the unannounced Nokia 9 PureView, and its rumored penta-camera setup. Today, Slashleaks posted renders of a silicone case believed to be designed for the phone, and the back includes cut outs for the five camera sensors and an LED flash. The cut out on the top of the phone is designed for a microphone, not a 3.5mm earphone jack. It was just last month when Samsung unveiled the Galaxy A9 (2018), the world's first smartphone with a quad-camera setup. And just a month later, we are talking about the possibility of soon seeing the first handset with five cameras on back. Of course, back in July we showed you the prototype smartphone made by Light that caries nine camera sensors on its rear. In August, Nokia licensee HMD Global purchased the PureView branding from Microsoft. The latter had acquired the name when it bought Nokia's Devices and Services division in 2013 for over $7 billion. It was first used with the 2012 Nokia 808 PureView, a Symbian powered phone with a 41MP camera in back and a .3MP camera in front. The rear-facing sensors on several Nokia Lumia Windows Phone models were branded as PureView cameras. After a period where the brand was not used, this would seem to be a propitious time for HMD Global to reunite the Nokia name with the PureView trademark. Nokia has teased an event that is taking place in Dubai on December 5th. Will the Nokia 9 PureView, with five camera sensors on back, be introduced on that date? Actually, we expect that if a brand new Nokia model is unveiled at that time, it will be the Nokia 8.1. If there is no Nokia 9 PureView introduced at that time, we might have to wait until 2019 for the model to appear. I think I'm going to pass. I just don't think this is going to really be anything to write home about especially with the One+ 6T available. I think Nokia is far too late getting their flagship device out. And who said that it won’t? We won’t know for sure until it’s released. So, what's the point of daydreaming then ? Let's just wait until it's released and then have the epik xd keyboard warrior battle. So what if he didn't, I'm not talking about an individual here. Who’s daydreaming? Seems like you’re already starting the “epic” keyboard warrior battle. You’re going at him based on an assumption, and yet, you’re doing the same thing. The hypocrisy is real. Classic response from a person when someone responds to them that makes sense, lol. LMAO! I thought you said that you’re not wasting your time on this? You’re like Fox News, don’t know when to quit when you’re behind, lol. Lol, you still here after you said you’re not going to waste your time? And it was much better than your “Shapiro” comment, junior. He didn’t praise it here. He pointed out that there is someone complaining about it for the sake of complaining since they don’t know anything about to judge it against other smartphones. Definitely can't wait either. This phone is going to be a whole lot to write home about, especially with what's sure to be an innovative 5 camera set-up, even with great smartphones like the OnePlus 6T available. HMD took their time to get it right, and as long as that's the case, it's not going to be too late. I’m so eager for the Nokia 9 to be released, already! I really want to see what the 5 lens set up is capable of. I’m anticipating really good things from this smartphone. I can see there are 7 spots. There are clearly 5 cameras & a flash. What's the last spot? I was just thinking out loud with a guess. It's from the old school camera mentality in me. A previous article here suggested it was a dummy hole with no purpose other then to keep uniformity on the back of the phone. I'm not sure I buy that argument but it could also be true. Cheers. I was thinking that it’s some sort of dual flash set-up maybe? In any event, can’t wait for it’s release to see what it’s all about. Yup, and I hope they introduce this December 5 in Dubai. If not I bet they'll at least give some sort of teaser. Yeah, I didn't think about that. That's a good guess. It's possible, but the back could be uniform/symmetrical with just six holes even if only is a flash. Don't know maybe a infrared laser? Some old Nokia phones had those with the camera setup.